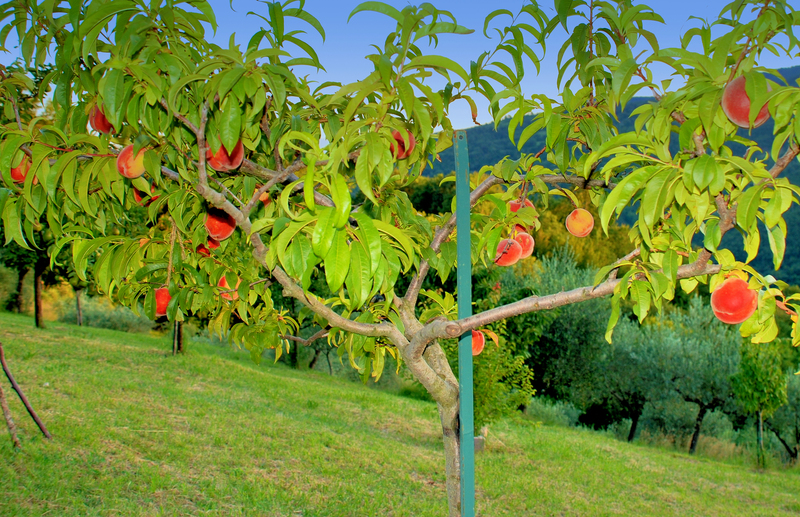 These are the peaches which ripen earliest. I ate one today and it was very juicy and quite delicious. Visually speaking, spring and summer in Italy are heaven on earth. In my experience, there’s nothing quite like the radiant, colour-enhancing light. Therefore, when the long winter comes, I like to surround myself with reminders, and the cool grey of my filing cabinets is the perfect foil for some photos. On the top drawer is a vase of roses, then descending, hibiscus flowers, pink roses and a sunflower. On the side of the cabinet is an arch of roses over steps, and more roses against the backdrop of the house. I’m fond of roses, you see. On the side of the small cabinet is a picture of the local shepherd with his flock, and on top is a ‘worry sheep’ to be squeezed in moments of frustration – of which there are many. 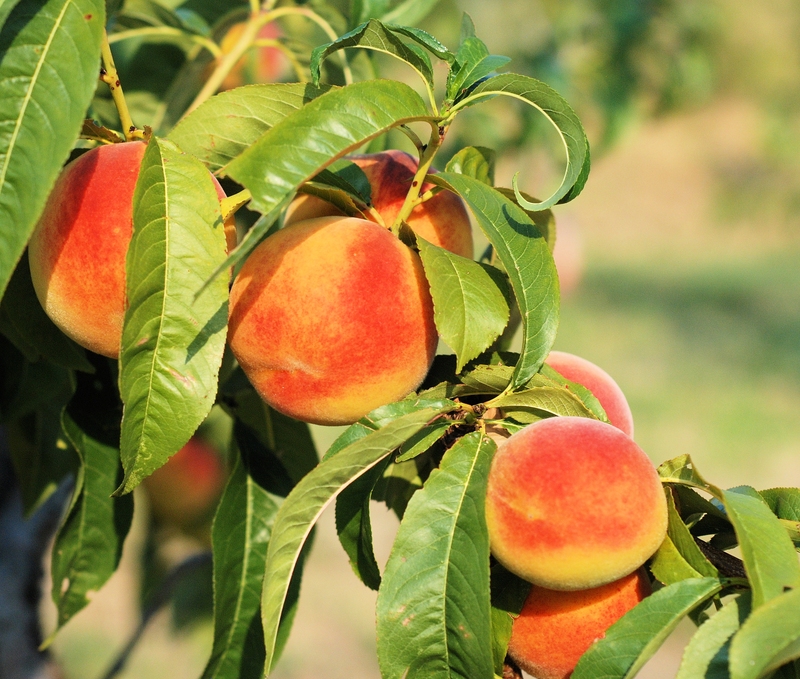 On the other side of the desk, out of view, is a peach tree with branches outstretched, laden with peaches. As I sit at my desk – whose brown corner just shows in the photo – all I see is beauty, on every surface. 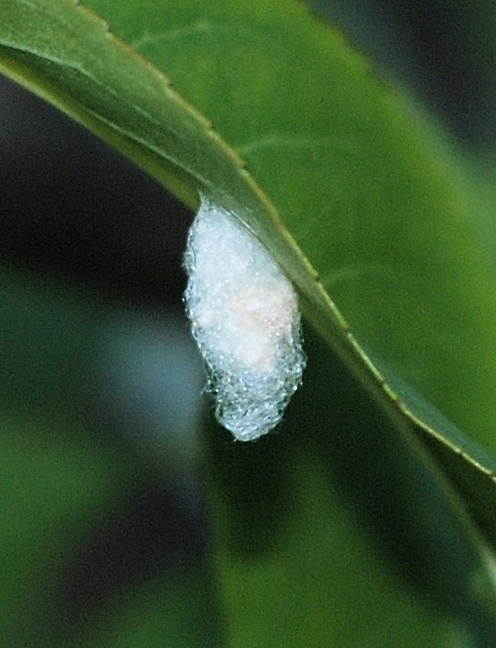 I spotted this little chrysalis on the underside of a peach leaf. When the photo was taken, the leaf was still on the tree, but it’s now in a jar with air-holes. I’m hoping the chrysalis will hatch and show me what manner of beast I’m dealing with. I wouldn’t be in the least surprised if it was some pest I ought to know about. In order to create the orchard, we dug up a piece of olive grove in which there were young olive trees, mostly not thriving. Scarcely noticeable in the tangle of old fence, vine and long grass, were a few spindly fruit tree saplings – apple, plum, peach and cherry. We proceeded to plant our orchard in the customary grid fashion, and for a while all seemed in good order. 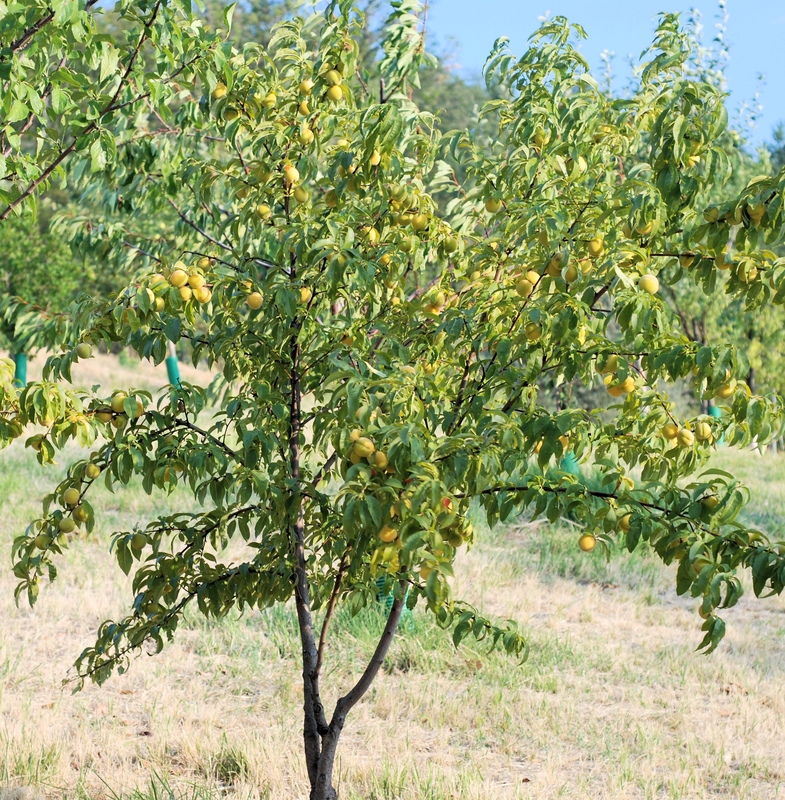 Then a couple of years after the digging over and manuring of the ground, 3 tiny fruit trees appeared in total disregard of our careful spacing: 2 peach trees and a cherry tree. 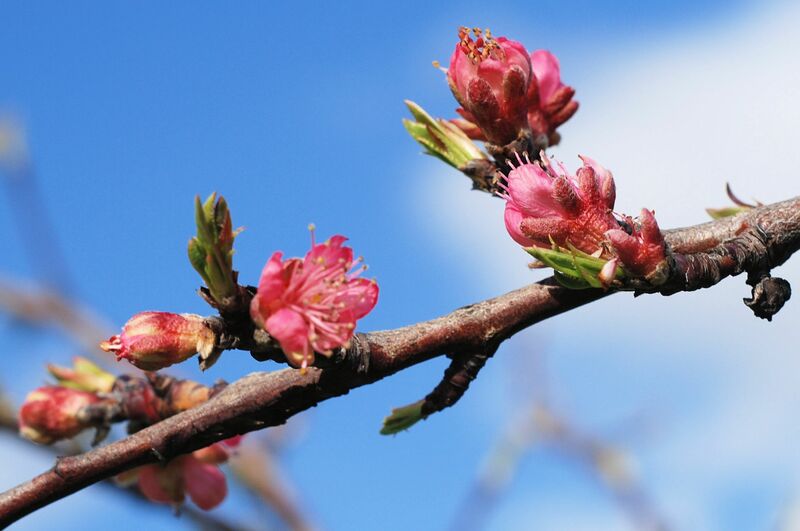 The cherry tree had its first cherries this year (total number: 2), while the peach trees have bushed out and are each bearing a good crop. 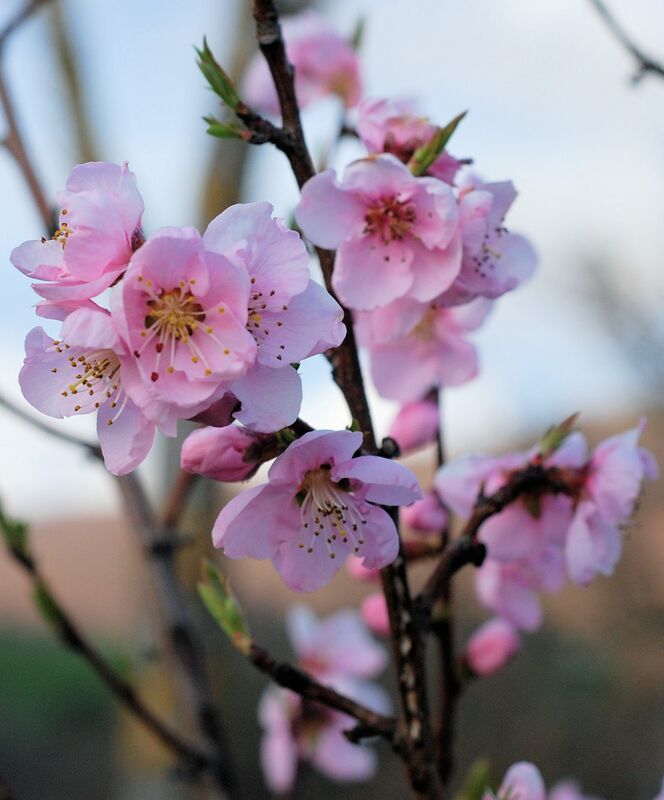 The peaches on these ‘regrowth’ trees are small but perfectly formed like the plants on which they grow. They are sweet, yellow-fleshed, quite hard, and keep well. 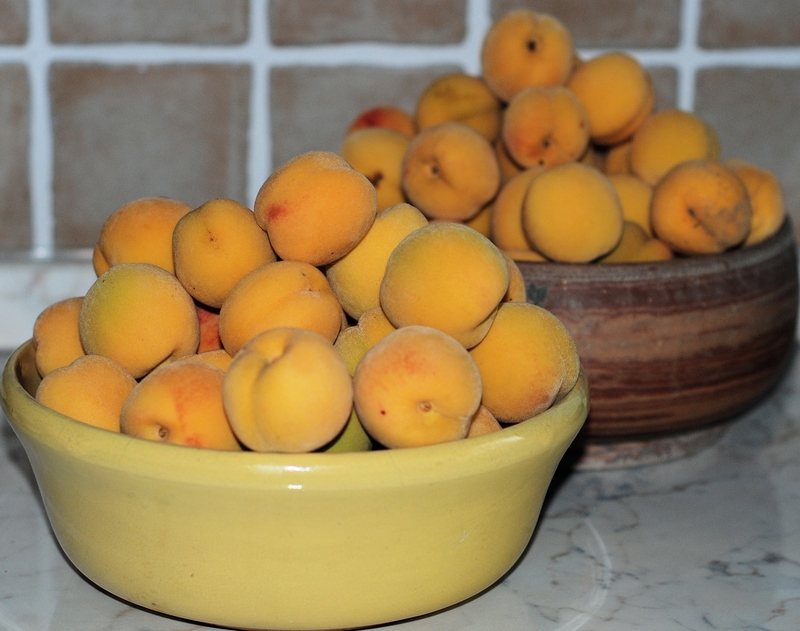 If you don’t feel like munching into a great big dripping peach from one of the regular trees, then one from the little urchin trees is just the job. There are far too many to eat raw. So far we’ve peeled them, cut them up, part-stewed them and frozen them unsweetened ready to use at a future date. 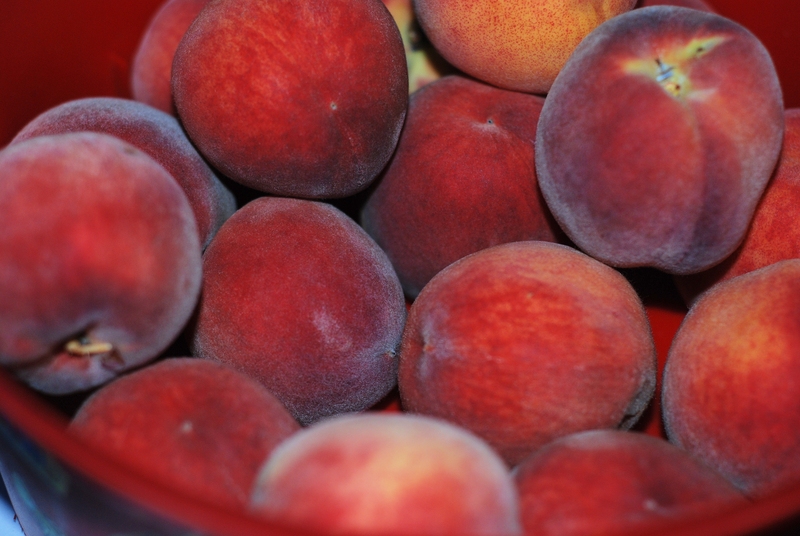 I love our peaches. They’re the sort you have to eat over the sink because they’re so juicy. 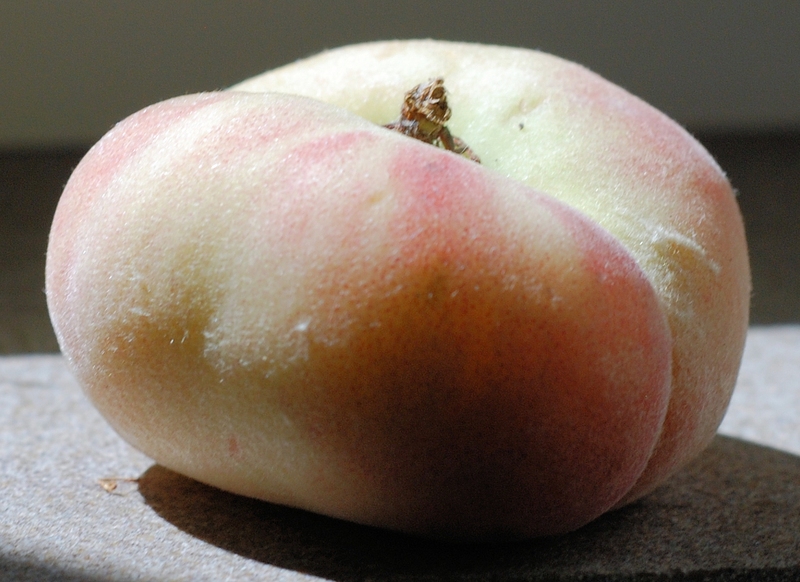 But at the risk of being disloyal, my very favourite sort of peach is the saturn peach. I buy them when I see them in the shops. They’re flat in shape and quite small, their skin is exceptionally delicate, and their white flesh is crisp yet juicy with a mild, sweet flavour. I must try and grow a tree of them sometime.